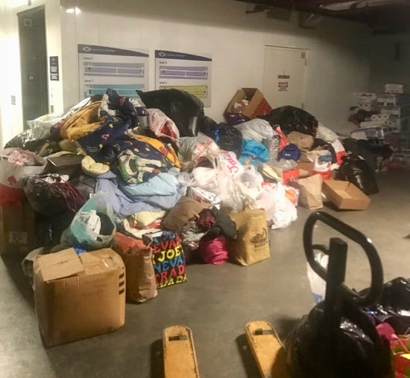 Seaport Storage, just off of Woodside Road and Highway 101, has arranged to deliver needed items for fire victims to its facility in the North Bay. A complete list is below. Justin Wethington, manager of Seaport Storage, is in direct communication and cooperation with the shelters in the wine country. The list was sent to him by his counterpart there. The address is 1703 E. Bayshore Rd, Redwood City; the facility will take donations from 10:00 am to 4:00 pm. He also supplied InMenlo with a list of participating sponsors, both individuals and organizations. They include Woodside Terrace Kiwanis Club (Justin is an active board member), the David Brett Company (owner of Seaport Storage), Mary Gilles of Alain Pinel Palo Alto, Lynne Mercer Alain Pinel Menlo Park, Woodside Priory School, Henry Ford Elementary, Collection 55 Wine Cellars, Google School, Amazon.com, John Muir Medical-Walnut Creek, Kaiser-Walnut Creek, among others. Help North Bay fire victims on Saturday, Oct. 14 by bringing specified items to CERAS (Center for Research and Education at Stanford) on the Stanford campus 8am-2pm. North Bay educators meeting there Saturday will bring the items to shelters. Writes Linda Bauld: We are all heartbroken with the news of destruction affecting our friends in the North Bay. We have teachers who have lost homes and schools, yet are still joining us Saturday as they pursue National Board Certification. Since we are holding a session tomorrow and some of our Marin folk are attending, this is a great opportunity to lend them our support. Can you bring non-perishable food, blankets, toiletry products (as specified below) to the CERAS ground floor lobby tomorrow between 8:00 and 2:00? We will load up cars and deliver it back to the North Bay either tomorrow afternoon or Sunday. If you have some empty boxes that would help as well. I know this is last minute, but let’s do what we can. Latest update from a Marin teacher: New socks, new undergarments, for all ages, adult diapers for the elderly are in great need. We are in dire need of ready-to-eat, non-perishable foods that we can provide to the evacuation centers immediately. These foods should be easy to open and easy to eat – many shelters do not have kitchens for heating and preparing food. Please do not bring glass containers. They have specifically asked for things like granola bars, trail mix, fruit cups, canned soups – things that can be easily distributed and don’t require use of a kitchen. Gift cards are a big ask for places like Target, hardware stores, etc.- things that will allow those who are displaced to get exactly what they need for their families.